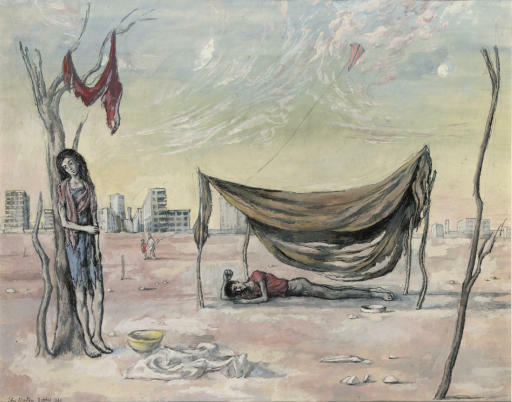 Minton executed The kite in 1940 as an expression of his disapproval of the war. A year earlier in October 1939, he had registered as a conscientious objector, and the figures and desolate landscape here convey this. Frances Spalding writes, 'Though they evolved out of actual experience, he was not concerned with topographical accuracy but with using what he saw to create a theatre of the soul, and arena in which to explore Kafkaesque feelings of wretchedness, guilt and alienation. Minton often populates his scenes with ragged waifs, lonely adolescents or clinging lovers who ruminate passively on the distruction around them' (John Minton Dance Till The Stars Come Down, London, 1991, p. 36).